Tight Fists of the World, Unite! The Tight Fist is dedicated to giving its readers impeccable advice on how to live frugally and save money. However, it has been brought to my attention that some of you poor souls out there simply don't understand why this is important. Why is living frugally beneficial? Why shouldn't you just spend all your money when you have it? Isn't living paycheck to paycheck in constant debt totally awesome? In answers to these and many more questions, I present my Raison d'être, The Tight Fist Manifesto. A spectre is haunting the world-- the spectre of wasting money. Throughout the western world, people have never had more outlets in which to waste their money, and it has become an addiction. At first it felt good; it was just for fun, to let loose and relax. But then it became a habit, a way of life. You no longer thought about whether you were making smart purchases- that would only hold you back. 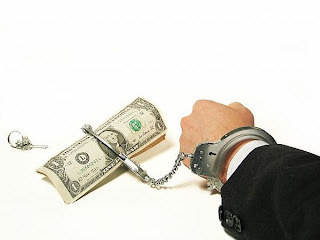 You thought that by spending freely you would be able remove the shackles of constantly worrying about money, but instead you lost yourself in the myth that you could buy yourself happiness. The Tight Fist is here to shatter the myth, and to help the good citizens of the world take back their purchasing decisions. The Tight Fist is here to show you that the key to financial ease and security is not to be found by joining the rat race and trying to strike it rich, but is accessible to everyone, regardless of wealth. Do you have a steady income? Are you always broke? If the answer to the following two questions is 'Yes', THERE IS SOMETHING WRONG WITH YOU. Let me guess, every day you start with your Starbucks, grab a $10 sandwich with your colleagues, and slip in a drink after work. Yet when it comes down to doing something awesome like spending a week in Mexico or seeing that band that you've been air-guitarring to since you were seven, you are suddenly broke. The problem is that since you spend all of your money on stupid crap that you don't really need and don't take the time to think about how you spend your money, you rob yourself of the opportunity to do truly awesome things with your life. 1. Do not buy crap you don't need- And especially beware the trickery of branding and advertising that make you think you need useless, unnecessary crap. 2. Always think before you spend your money- Before you buy those Louis Vutton sock liners, just think for a second whether this purchase is the best use of your hard-earned cash. A little thought can go a long way. Everyone longs to never again have to stress about money. Many people think that by living as a Tight Fist, this means constantly worrying about money, but they are mistaken. Only by constantly thinking about your spending can you make all your monetary worries vanish. A Tight Fist always has money to spend and never goes broke. A Tight Fist is never in debt. A Tight Fist is never longing the things they can't afford because they see through all the advertising and consumer mentality BS. A Tight Fist has been freed from the shackles of money, and is truly content. Sound appealing? Tight Fisters of the world, unite! You have nothing to lose but your poverty. This philosophy sounds more like engineering than economics. All of the gadgets we depend on in our daily life could be made to run faster or be built cheaper or lighter, but a margin of error is built in. Its more important that my computer runs reliably than runs super-fast. My car is over-engineered to keep me safe during a statistically unlikely event. Because of a narrow minded focus on deriving material gain or excessive convenience, we become strangled in debt and obligation that keep us from making rational decisions. The tight-fisted one, who eschews immediate reward, makes better long term decisions - free of overwhelming financial anxiety, and will ultimately achieve greater success. I believe thought is a valuable resource to be used sparringly. While I know i can't spend my way to happiness, I can't save my way to happiness either! Happiness is a state of mind not spending or saving. Once you get that the tight fist goal become easy! 2) Those Starbucks you talk about can be made free. You can using only 1 Five dollar gift card, register a birthday at least 30 days ahead of today. Then use that same card to buy another gift card and register another birthday 30 days ahead. You can make enough for 3 or 4 per day so you get to eat free food from Starbucks. The empty gift card that is registered needs to be dated so you can use it again next year. Make sure you use have a Starbucks barista reload the card using the same $5 that you had always been using. Do so about a month prior to the anniversary of the birthdate. This time rather than registering a new card, you simply need to reload the money from one card to another. But you need to do it at the till not online yourself so it becomes a purchase, not a transfer. You are going to take the next card and reload the next old card and pay for it with the card that you just reloaded it with. This creates a purchase which is necessary to activate a birthday once a year. The one five dollar will buy you thousand free drinks or food items from Starbucks. Imagine having a friend or coworker asking you to go grab a venti mocha for you. He gives you five bucks. You use your birthday reward, and you now got your five bucks back, and you still have five bucks in your card. Bounce the five dollars back and forth 30 times and you are a gold card holder with one card. You can now have free refills into your cup and never pay for coffee again. Before the end of the day, get an iced tea or coffee so they put it into a plastic cup. You can alternate from hot to cold from coffee to tea. This will give a legitimate excuse to have the barista change cups to new ones so it doesnt get old and break down. At the end of the day, a plastic cup sitting overnight in a cold beverage used to refill into a new cup they cant tell it is old as plastic doesn't decay. Get your coffee double cupped. If you have a friend who wants a coffee like a tall, get a hot tall water to go also, and pour from your venti free refill and dump out the hot water and give him a coffee. You have half of your coffee from the venti and you can ask for anther refill short while later. You can even charge your colleague for that tall coffee or treat him to it, and later maybe he will treat you to something non starbucks that isn't free.